Split is Croatia’s second largest city, and it’s jam packed full of culture, history and lovely locals. Perfectly located on the Adriatic coast, it’s also a great coastal destination. The city is one of the most historic cities in Europe, so you can expect to find plenty of old and unusual architecture, influence from several different time periods, and every street tells its own story. All of which make for perfect photo opportunities. There’s no denying that everyone and anyone will appreciate and fall in love with the beautiful city of Split, but fans of the television series Game of Thrones might just become the biggest fans of this Croatian city. The quaint red roofs of the city’s buildings, the cobbled streets and stone walls also throw visitors into a Game of Thrones setting. Whilst Split’s sister city, Dubrovnik, has become well known as the real life Kings Landing, Split has it’s own Game of Thrones claim to fame. Any fans of the popular television series will remember the fictional city of Meereen, for which Split was the filming location. One of the best ways to explore new places, and beautiful destinations, is with your closest friends. These friends managed to capture the beauty of their friendship in this charming old city, with the help of a professional vacation photographer. 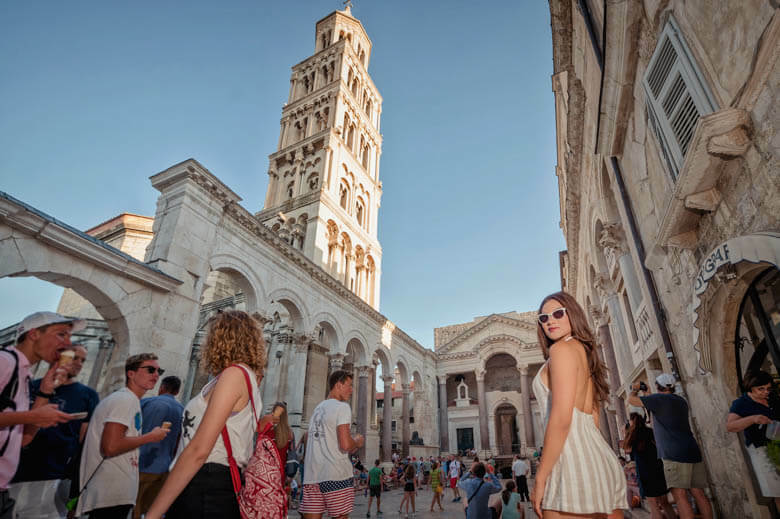 Amyi and her friends hired Zeljko, one of our amazing personal vacation photographers, and made the most of Split as the perfect backdrop for their photo shoot. A trip with friends is always worth remembering and having a souvenir of, and their photo shoot left Amyi with beautiful photos that she can keep forever. Dressed elegantly in neutral colors, Amyi had some stunning solo shots taken, where she truly blended in with the charming appearance of the city. It can be difficult in a busy tourist destination to know where best to get unique shots of only you and your party. But Zeljko was able to suggest the best locations for the friends to pose, away from the crowds. They made the most of the amazing architecture that’s stood for years, and Zeljko photos of Amyi and her friends exploring unique locations. They posed under stone archways, looked out to sea, climbed hundred-year-old steps, whilst Zeljko captured their curiosity at the city’s sights, and their moments that showed true friendship. In a single photo shoot, Amyi and her friends were able to come away with photos that captured the amazing diversity of the city. No city is the same throughout, but Split has a lot of different sights to offer. From the modernity of the harbor, to the ancient looking stone streets and architecture, to the vibrant green nature that coexists with the city, Zeljko was able to create a truly varied portfolio of photos for Amyi. They managed to pack so many different photo spots and opportunities into their photo shoot thanks to their personal vacation photographer’s excellent local knowledge and expertise. As well as capturing the different aspects of the vibrant city, Zeljko also made sure to capture the different expressions of Amyi and her friends in the different locations. We see photos were Amyi is amazed, curious, thoughtful, and of course overwhelmingly happy.